Meet Pusheen, a cute, chubby domestic short haired cat who stars in her own animated web comic series. Pusheen has captured the heart of over nine million Facebook followers, with many of them sharing these humorous little memes on a daily basis. Now you can be the proud owner of a cute and cuddly Pusheen by GUND either as a soft toy, back pack clip, purse or pencil case. This super soft and squishy Pusheenosaurus is trying to look a little scary but everyone knows she is always ready for a cuddle. 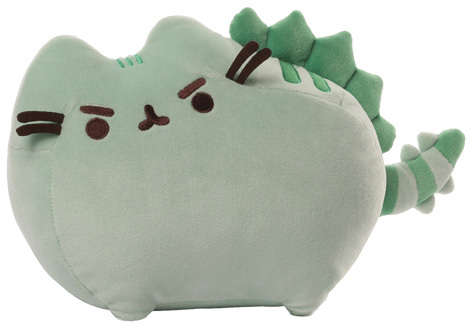 Please tell us what you think of Pusheen by Enesco and Gund.